So, I’ve made so many things, but have so little time to get them up on my blog. I thought I would quick throw one up there for now. 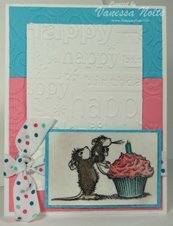 This is a card I made for an embossing challenge at Angel Wings & Crafty Things. I tried a new technique on this one. 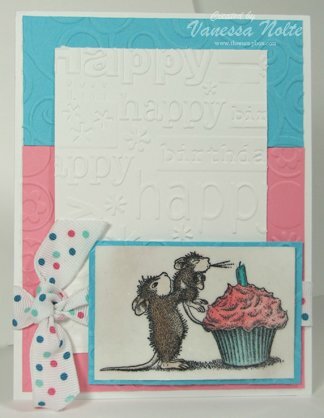 I stamped then entire House Mouse stamped paper with the Versa Mark, then used clear embossing powder over the top. I repeated this a couple times to get it to be very glossy. I really liked the way it turned out. You can’t really tell that it is embossed in this picture. I had a hard time capturing that. Have a great weekend! I love the colors on this card!